PV, Batteries and the Smart Home: Is the Solar Industry Getting Ahead of Itself? Leading solar companies are moving beyond PV and into home energy management. Is the mass market ready? But is the market ready for it? That’s what many in the solar industry are asking as top companies look to expand beyond the rooftop and get deeper into the home. Most agree that the shift toward customized energy packages is inevitable. But there’s still disagreement over how quickly the trend will take hold -- or if solar companies are best equipped to lead the shift. According to a new survey from Clean Edge and SolarCity, half of Americans think solar is the most important technology for the country's future. However, only 6 percent said they'd consider buying a PV system within the year, while 12 percent said they'd buy a smart thermostat. “I think we’re getting a little out in front of ourselves,” said SunPower CEO Tom Werner, when asked if market realities match the hype around integrated energy offerings. Werner's comments aren't a sign that SunPower is holding back. For years, he's called his company an energy services provider, not a solar provider. And recent activity reflects that philosophy. Last December, in an early effort to expand its suite of products, SunPower invested $20 million in the home energy software company Tendril and partnered with the solar-storage integrator Sunverge. 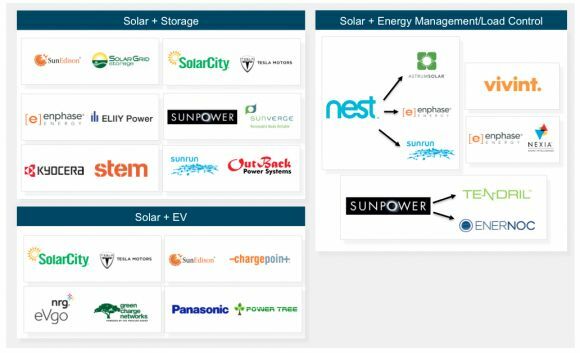 Most recently, SunPower teamed up with EnerNOC to pair solar with commercial and industrial energy management offerings. The company has also undertaken numerous pilots coupling solar with electric-vehicle chargers, smart appliances, and lithium-ion batteries in new homes. None have resulted in any major business yet, but they indicate where SunPower is headed. These moves are not unique to SunPower. As illustrated below, most of its competitors are engaged in similar partnerships and pilots in an effort to strengthen customer relationships. GTM calls these types of offerings "solar plus." However, Werner said there's still "a ways to go" before companies can provide solar, batteries and energy management offerings for the mass market. "I'd tend to agree that it's going to be difficult." SunPower isn't targeting the masses yet. Rather, the company is currently looking to upsell home energy management products to current solar customers. Werner's philosophy: "Start small, start focused, get it to work, and then expand." Alternatively, SunPower could sell solar services through a software company like Tendril, which is already reaching millions of utility customers through energy savings programs. "I don’t think the idea is to go to the mass market and say we’ve got solar, plus energy management, plus storage," he said. "I think the idea is to offer [existing solar customers] a service that makes complete economic sense." The economic case will vary across states and countries. In Australia and Germany, battery storage paired with solar makes more sense because of high retail electricity rates and network charges -- the reason SunPower has been operating pilots in those markets. In America, where utility-supported "bring your own thermostat" programs are gaining traction, marrying PV with HVAC automation may be the most attractive immediate option. This is what SolarCity and Nest believe will be a catalyst for integrated solar offerings. Brian Farhi, head of new channel partnerships at Nest, was a bit more bullish than Werner about the near-term potential of integrated solar-energy management packages. In an interview, Farhi reiterated his previous comments that all relevant U.S. solar companies will be actively expanding beyond PV installation within the next five years. "I firmly don't believe solar has anywhere to go without adopting this type of technology," he said. Consumer preferences are only one reason. The most important changes, said Farhi, will come from rate restructuring that includes time-of-use pricing, fees on net metering and possibly more residential demand charges. With utilities concerned about reliability and cost-shifting in areas with high solar penetration (whether accurately or not), the technology will need to become a more effective load management tool, argues Farhi. "In the future, solar on its own isn’t going to work. Our goal is to have every solar system with load management come from Nest," said Farhi. With America nearing the installation of a cumulative 1 million solar systems, the upsell potential for new and existing customers is vast. And it's not just technology companies that are looking to tap it. Competitive energy supplier NRG Energy has staked its growth on solar-based customized energy packages it calls "personalized power." The company's own internal research found that 18 percent of Americans -- which equates to 22 million homes -- are interested in such a product. NRG is now the fifth-largest residential solar installer through acquisition, and executives think they can use the business to do what power companies have always avoided: get people to pay more for energy. "Those consumers who represent those adopter markets, they're willing to pay a bit more for those kinds of products and services. And they're willing to exchange data for them in order to get the personalization features that they can get in the other products and services they use in non-energy markets," said Steve McBee, the CEO of NRG Home, speaking about the company's outlook on the Energy Gang podcast. Retail energy companies like NRG have always had much thinner relationships with customers than regulated utilities. 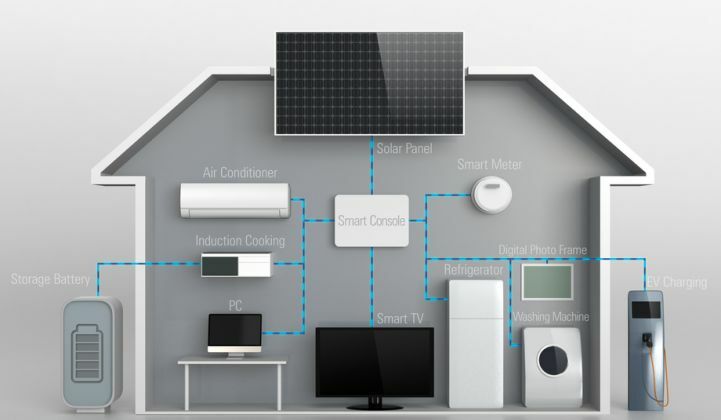 Executives like Tom Matzzie, CEO of the competitive energy supplier Ethical Electric, thinks the industry can thicken relationships by offering smart home devices, possibly in partnership with solar providers. "The opportunity to start bundling is arising. Everyone is asking, 'Is the integration going to get customers to pay more?'" according to Matzzie. With very little data so far, it's unclear how successful early pilots and partnerships have been. Nor is it clear who will command the new world of customized power. Will solar companies dominate by offering integrated solar, storage and load-control packages? Will software companies or smart appliance vendors be the dominant platform for upselling? Will utilities use their own customer relationships to bundle energy services? It will likely be a combination of all three. "I think 10 years from now, you're not going to be able to distinguish between a residential solar company, a home energy management company, and a residential storage provider," said GTM Research VP Shayle Kann.